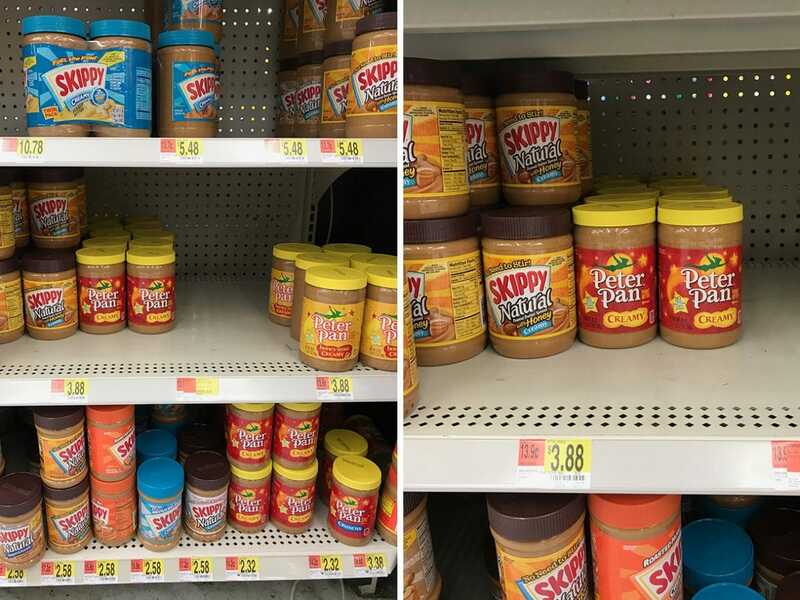 Interested in purchasing Peter Pan Peanut Butter? Hover over the photo above to click through to Walmart.com and buy it! 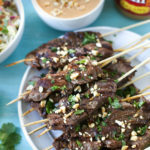 Grilled beef satay is a relatively new dish for me. 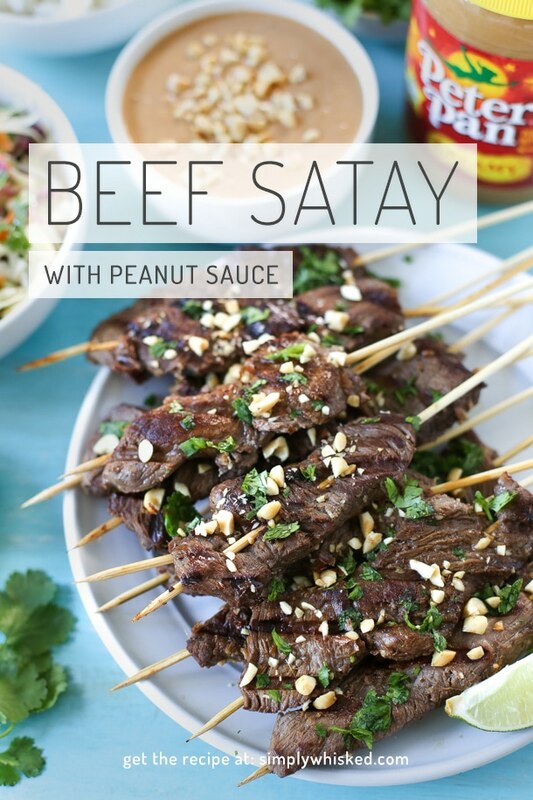 I’ve made peanut satay plenty of times, especially with chicken and meatballs, but I’ve been finding such great deals on beef at my local grocery store it’s hard not to eat it at every meal. For this recipe, I used sirloin steak, but last time I made this I used flank steak. It’s my normal choice if I’m marinating steak, but both work really well for this recipe. I love using peanut butter in recipes, especially savory ones. 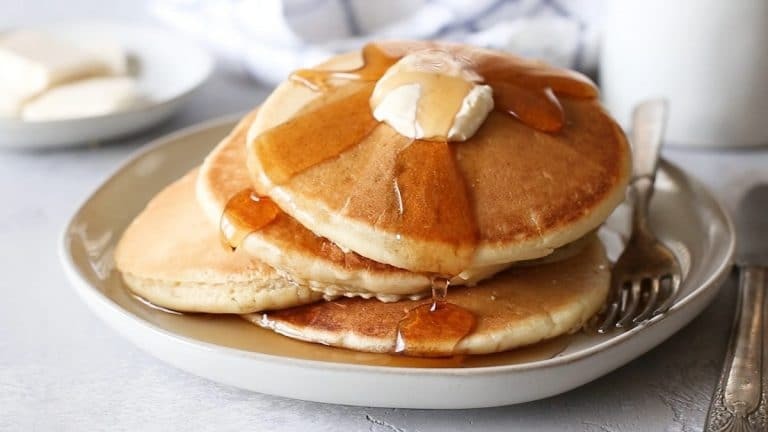 For this recipe, I used Peter Pan® Peanut Butter from Walmart. It’s delicious as a spread, or as an ingredient. It’s wholesome and has 8 grams of protein per serving, so I’m always ready for an opportunity to incorporate it into my recipes. This dipping sauce is creamy, spicy and savory. 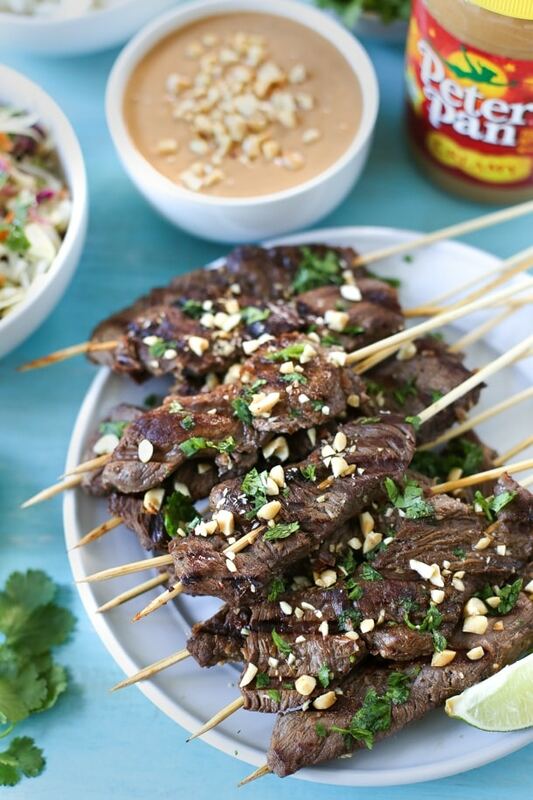 It balances perfectly with the sweet and tangy flavors from the marinade. I like to make double or triple batches of it and freeze the extra for other recipes. It’s great on noodles or in stir fries, and it holds up really well in the freezer. We served ours with my favorite jasmine rice and a big bowl of quick Asian coleslaw. It’s basically coleslaw mix with added cilantro, and I make up a quick Asian vinaigrette to toss it with, but you could use my favorite maple miso vinaigrette or even make a batch of sesame wasabi slaw if you’re up for it. Toasted wonton strips and sesame seeds would be a great addition, too. 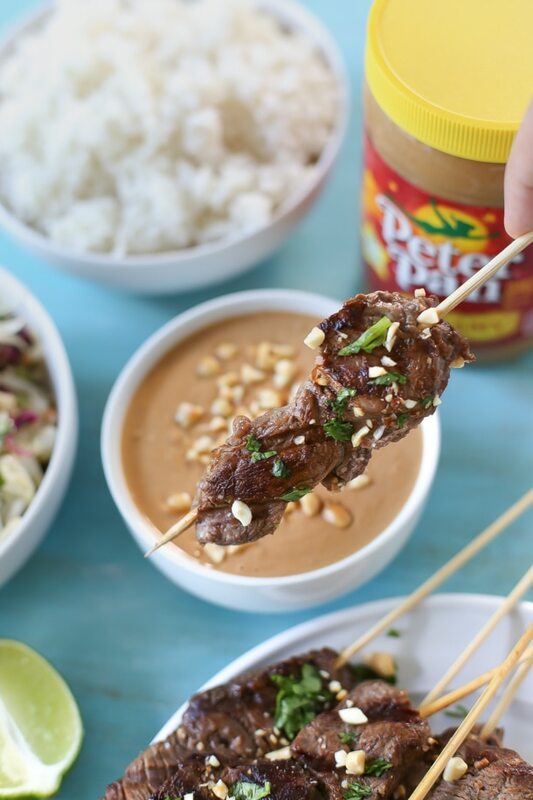 Grilled beef satay with peanut dipping sauce will make a perfect addition to you next barbecue menu. It’s simple to prepare ahead of time, and will be a nice change of pace from your usual grilled appetizers. If you want to find more summer cookout inspiration, look here. You’ll find lots of great summer recipes. In a medium bowl, whisk together the marinade ingredients. Place the steak into a large zip top bag. Add marinade and refrigerate for up to 24 hours. In another medium bowl, whisk together the sauce ingredients. If preparing the day before, remove from fridge at least 1 hour before serving to allow sauce to come to room temperature. Preheat grill to medium. Thread beef onto pre-soaked skewers. Grilled 3 – 4 minutes per side. 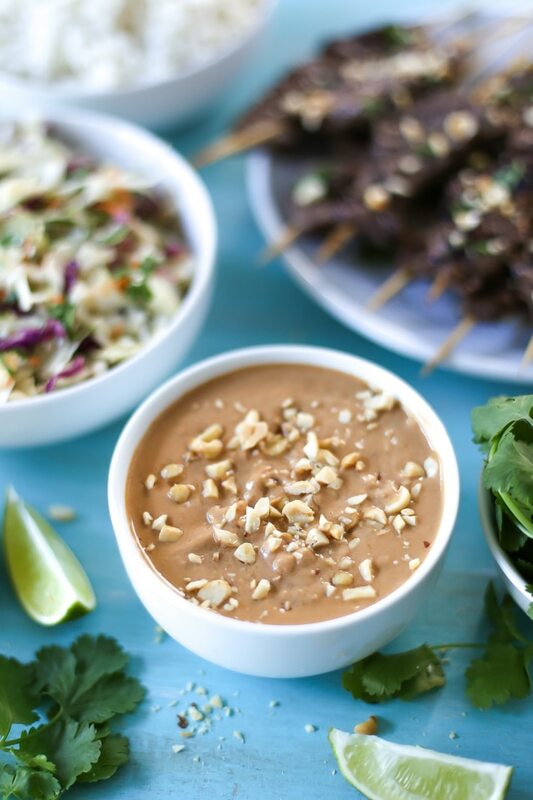 Remove from grill and garnish with cilantro and peanuts before serving with peanut dipping sauce. To make peanut butter easier to whisk into sauce, heat in microwave for 30 seconds – 1 minute.